(Celebrating 35th Anniversary – Match #1078):- Well, tick the box again as Cosmos continues to defy the odds as a team and celebrates thirty-five years of playing cricket in the Metropolitan Cricket League and in the process chalked one thousand and seventy-eight matches played, to date, as a club. It is a remarkable accomplishment, by any measure, and more so given chop-shop display that is New York cricket where loyalty to club is a thing of the past, and has become a scorned habit measured in one penny more than the other. But Cosmos kept forging ahead, and the game, in a broader sense, will always be better for it by those who continue to keep it alive. And so on a cloudy day to mark the beginning of the 2018 season Cosmos took the field after Lucas won the toss a elected to bat with the match was reduced to 30 over. 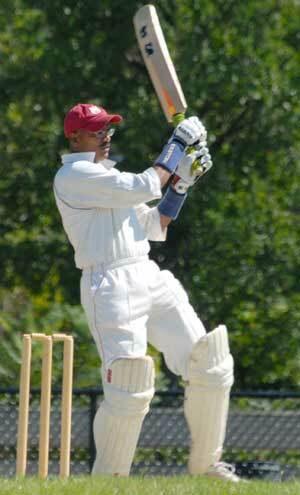 Sham Ali effected an early breakthrough when he tilted S. Taylor’s off stump in his 2nd over. Orval Crawford then survived a straight forward chance at mid-off off D. Sankar in the 4th over, and Cosmos subsequently paid the price for the let-off. A good 2nd wicket partnership between Crawford and J. Bryan took Lucas to 94 runs before off-spinner Alex Chunilall deceived Bryan with an arm ball that knocked over the off stump. Another partnership between Crawford and K. Thomas kept Lucas scoreboard ticking over as Cosmos searched hopelessly for a 5th bowler. Thomas was dropped on the mid-on boundary, and thereafter the pair ensured that Cosmos does not penetrate any further into their batting order. An excellent 116-run partnership gave Lucas a firm platform with O. Crawford getting 88 not out, and Thomas a breezy 74 not out when Lucas inning closed on 210 for 2 off the allotted 30 overs. S. Ali took 1 for 24, and A. Chunilall 1 for 30. Cosmos in reply got to 21 runs off the first two overs, perhaps the only highlight in the Cosmos inning, and that resulted a bowling change with N. Whittaker replaced by paceman, J. Bryan. Bryan struck two crucial blows in his first over when he had Daniel Chunilall in a tangle hooking a return catch. He then removed Debo Sankar in the same over ‘caught’ down the legside much to the courtesy of umpire Ramsay. Parmanand Sanicharran then slashed loosely at a wide and nicked to the wicketkeeper. At 21 for 3, Cosmos found themselves in some early trouble or much trouble with an inexperienced lower order. The two veterans, Royo Sankar (29) and Sham Ali (31 n.o), brought some stability to the inning. They posted a solid 67-run 4th wicket partnership pushing the total to 88 runs before Sankar was stumped for 29. Kevin Balgobin had a few sparks in his first outing before Cosmos inning closed on 124 for 6 in their allotted 30 overs. Cosmos will play Cooltech on Sunday at Van Courtland Park.